Back in the summer of 1985, I was working the first of what would be many McJobs over the course of my extended adolescence, manning the concessions counter at a mall multiplex in San Jose, California. At the time, Oakridge Mall “boasted” a rinky-dink six-screen shoebox (since replaced by a modern behemoth), which meant there was plenty of downtime between show cycles. Some of my fellow wage slaves brought in books to kill the dead hour after we’d finished cleaning and restocking; others developed meaningful relationships with the employees of the churro stand a few yards away. I, however, had a schedule to keep. Precisely 45 minutes after Pee-wee’s Big Adventure began, allowing time for trailers, I would go stand at the back of the theater to watch the Large Marge scene—not so much for its own sake (though it holds up remarkably well after several dozen viewings), but for the joy of experiencing it again and again with an audience that had no idea what was coming. The collective shriek of laughter inspired by the scene’s climax, identical every time, is forever burned into my brain. At the time, of course, I had no idea who Tim Burton was. Nobody did, apart from the handful of folks who’d seen his superb animated short “Vincent.” And perhaps they were mentally prepared for a sudden stop-motion explosion in the middle of an otherwise live-action cartoon. 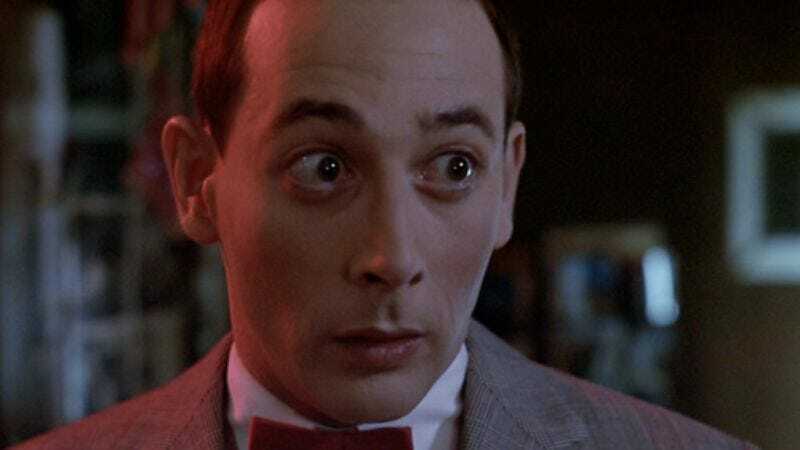 For the rest of us, however, Large Marge confirmed our growing suspicion that this movie wasn’t a disposable cash-in (Pee-wee Herman having already made a splash via a stage show, an HBO special, and various talk-show appearances)—and that its wonderfully warped sensibility transcended the character and heralded an exciting new talent. (The arrival of both Beetlejuice and the tepid, Randal Kleiser-directed Big Top Pee-wee three years later sealed that deal.) In the unlikely event that you’ve never seen this before, watching it alone on your computer won’t pack remotely the same punch as seeing it in a crowded theater, but do your best to imagine a hundred people emitting a delighted yelp at just the right moment. If I could somehow download and then upload my vivid memory of the sound for you, I would. One of the things that makes this bit work so well, I think, is the absence of any preamble whatsoever. Burton shoots the approach of Marge’s rig with a totally straight face: The headlights slowly cresting the far horizon, followed by the gradual reveal of Pee-wee from darkness, isn’t too far removed visually from, say, the opening of Kiss Me Deadly. And once Pee-wee climbs into the cab, Marge immediately launches into her death monologue, without so much as a sidelong glance at the passenger seat. I actually think it might have been even funnier had her opening sentence not seemed to be a direct response to Pee-wee’s casual observation (“What a night, huh?”), acting instead as a complete non sequitur. But that’s a quibble: Marge’s sepulchral delivery, coupled with Danny Elfman’s four-note Refrain O’ Doom (which I’ve always been annoyed isn’t included on the Varèse Sarabande soundtrack album), instantly lets us know that poor Pee-wee has once again flagged down the wrong vehicle. In essence, this is a sketch-comedy bit—the film was co-written by Phil Hartman, who had done time with the Groundlings and would join the cast of Saturday Night Live the following year. But it’s unusual, from today’s perspective, in that the focus of the scene is neither the film’s star nor some other random celebrity making a cutesy cameo. Put this scene in a contemporary Will Ferrell comedy and Large Marge would be played by Amy Poehler in a fat suit, or perhaps even by Paul Rudd in drag. (I wouldn’t put it past him.) Alice Nunn, on the other hand, was a complete unknown whose most notable previous credits were Mahala May Gruenecker on a show called Camp Runamuck and “Third Nurse” in the 1971 film adaptation of Johnny Got His Gun. Which means that we’re not entirely sure what to expect from her—we know this is a comedy, so we’re not afraid, exactly, but there’s still a sense of uncertainty that would be absent in the presence of a familiar face. And of course, the face turns out to be crucial. Now, there’s another observation I’m keen to make, but I need to tread carefully, since my lengthy diatribe on a related topic in the last Scenic Routes set a new world record for most instances of the word “douchebag” and its derivations in a single comments thread. (Maybe y’all will be more sympathetic to the general argument when it’s positive rather than negative.) Obviously, Burton chose to use stop-motion here because that was his background. In truth, though, I don’t think the scene’s big moment would be half as effective if it were done via today’s very best CGI. We’re accustomed by now to seeing apparently real objects undergo a convincing metamorphosis—it’s easily shrugged off, no matter how impressive. Stop-motion’s jerky frame-by-frame process remains oddly unsettling. And while modern F/X could easily achieve such an effect in a single unbroken shot, I must say I like the cut from Pee-wee’s scream to Marge quickly swinging her face back from profile, even though it resembles those moments when the stunt double gets replaced by the star. Without the cut, we’re marveling at the technique; with the cut, we can concentrate fully on the gag. Either way, it surprises me a bit that this classic scene has inspired so little imitation over the last quarter-century. Apart from the venerable Czech animator Jan Švankmajer, I can’t think of anyone offhand who’s employed blatant stop-motion in an otherwise live-action context, using its weirdly tactile quality in service of a goofy, unexpected punchline. (Perhaps the closest thing in spirit would be The Mask, though obviously that’s much more indebted to Tex Avery.) Is Large Marge so sui generis that nobody dares attempt a vignette in a similar vein, for fear of looking too baldly derivative? Or are there homages and tributes out there that I just haven’t seen? If it’s the latter, please let me know, so I can keep an eye peeled for revival screenings of the film in question. I’ve been waiting a long time to experience that happy shriek again.